Dean Mike Frasciello presents Charters’ son Alexander William Charters with an award recognizing his father’s contributions to University College. The University College 100th Anniversary Gala on October 6 was a festive celebration. Hundreds of guests enjoyed delicious food, live music, and a video filled with inspiring stories told by UC alumni. Honorees were the late UC dean and continuing education pioneer Alexander N. Charters, former UC dean Bea González, and the late administrative assistant Cindylou Gromney. 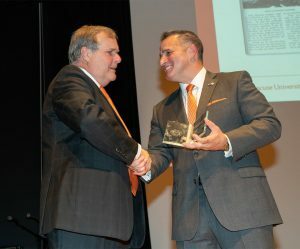 At left, UC dean Michael Frasciello presents Charters’ son Alexander William Charters with an award recognizing his father’s contributions to University College.